I have voluminous, curly hair – and lots of it! Nowadays, my hair and I co-exist quite happily. When I was a child I hated my hair, because it is so distinct out and made me stand out – something that every teenager inevitably hates. Of course, I look back on my past and realize now that this is ridiculous! Fortunately, I grew up and I became a more reasonable person who learned to love my amazing hair that accompanies and identifies me wherever I go. I now see my “crazy” hair as the result of many genetic laws, some environmental conditions, loads of years and of course, a string of coincidences: the prevalence of curly hair in European descendants is only 15%! Sometimes, though I do not know why, humans make decisions based on appearance alone. In my humble opinion the most interesting things are deeper and explain why living things have evolved in various ways. My relationship with my curly hair inspired the content of this post. I realize, though, that it may not be so important for potential readers… so, let’s move on to the main topic: The differences observed in plant leaves. If you are lucky enough, you can look out of your window now and see trees and their leaves. Maybe there are different trees with consequently different leaves. Some may look more beautiful than others, simply because they follow a typical beauty principle which is pre-established. Plant leaves grow to different sizes, shapes and colors due to many factors. Just like our different types of hair or skin colors, some leaves are better or worse prepared for responding to particular stimuli in a given situation. These differences sound quite exciting, don’t they? During my thesis, my hair and I had the opportunity to work with plant leaves. When I first began, I even used to confuse different species of leaves. 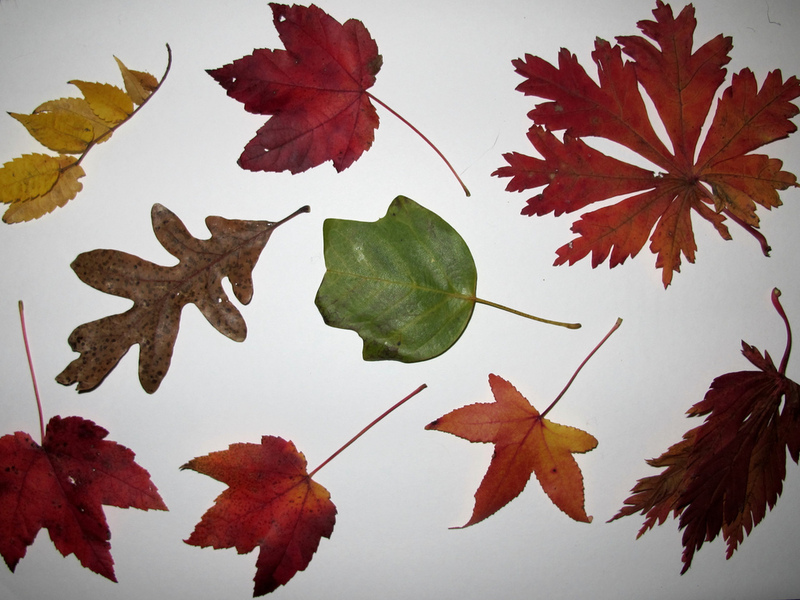 Informally, I classified the leaves on a scale of ugly to stunning, and included levels that ranged from “regular” to “beautiful” (you can imagine how easily I confused similar species!). Nowadays, not only can I distinguish between many species, but I can also easily identify which leaves are older, and which have grown under more or less amounts of light. My lab specializes in ultrasounds. In 2009, my supervisor and colleagues proved that many mechanical characteristics of leaves could be extracted using the Non-Contact Resonant Ultrasound Spectroscopy Technique (NC-RUS). Since biological tissues often present high attenuation and can be geometrically challenging, it was not expected to obtain such good measurements of coefficient transmission for plant leaves in air. The cell wall which is present on vegetal tissues enables multiple reverberations inside the leaf as consequence of wide-band ultrasonic pulses propagation through it. These generate a mechanic response that can be sensed. This NC-RUS technique is non-contact, non-destructive, non-invasive and rapid, which are key advantages over many other materials characterization techniques, particularly in this case. Additionally, we discovered that many parameters can accurately estimate the plant water status based on intrinsic properties of the leaves, such as density, attenuation, sound velocity, thickness, acoustic impedance or elastic modulus. This is of high interest to many fields, from ecophysiology to agriculture – and even to increase the accuracy of some climate change models. In some experiments conducted during my thesis, we studied the response of several leaves with changes in abiotic stimuli such as light and water. We selected leaves that represented different growing conditions. We used evergreen and deciduous species as well as dicotyledons and monocotyledons. Also, we included leaves of the same plant that grew in varying levels of darkness and direct sunlight. Evolution of the thickness resonant frequency of a Dracaena marginata and Vitis vinifera leaves over 3.5 days. Photosynthetic photon flux (PPF) and ambient temperature measurements are also shown. The results of these experiments were amazing: Accounting for the variation of the frequency at the first peak of thickness resonance in the transmission coefficient of the leaf showed an inverse relationship between the amount of light received by the leaf and this frequency, which is related to the velocity at which sound travels through it, its density or its thickness. This makes sense, since leaves tend to close their stomata at night when there is no sunlight for continuing photosynthesis. Doing this minimizes evapotranspiration. And, surprisingly, this produces a mechanic response than can be sensed by ultrasonic waves in the [0.1- 2] MHz frequency range. 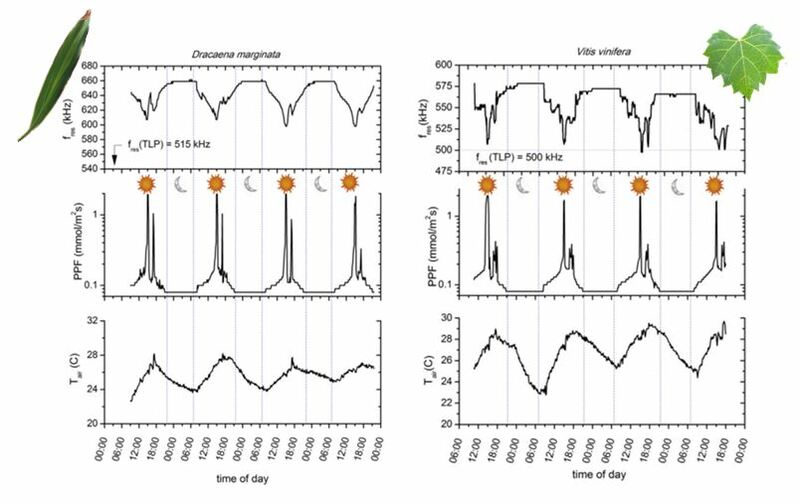 Also, we monitored leaves attached to the plant during several days in order to follow this variation of resonant peak frequency with varying amounts of solar light. Results depended not only on the plant species but also on the conditions in which they grew: Some behave as if they have a threshold. In case this threshold is reached the resonant frequency is maximized, and increasing amounts of light don’t make this frequency go higher. Instead, it stays in a saturated state. At the same time, other leaves have a frequency variation range which is significantly higher, so small changes in the amount of light cause changes in frequency without reaching a saturated state under regular sunlight conditions. I could keep writing on these issues, but I think this is enough for the primary objective of this post: Next time you see someone with a “prolonged” bad hair day… Don’t unfairly judge them outright but instead investigate deeper! There is a lot of scientific evidence behind different looks and characteristics. Fariñas, M.D. et al., 2014. Monitoring Plant Response to Environmental Stimuli by Ultrasonic Sensing of the Leaves. Ultrasound in medicine & biology, c, pp.1–12. Available at: http://www.ncbi.nlm.nih.gov/pubmed/25023117. Sancho-Knapik, D. et al., 2013. Ultrasonic spectroscopy allows a rapid determination of the relative water content at the turgor loss point: a comparison with pressure-volume curves in 13 woody species. Tree Physiology, 33(7), pp.695–700. Available at: http://www.ncbi.nlm.nih.gov/pubmed/23933828. Lola Fariñas is currently finishing her PhD at the Spanish National Research Council (CSIC) in Madrid (Spain). She has a background in elecommunications and biomedical engineering. Her research focuses on characterization of multilayered materials, specifically vegetal tissues, using ultrasounds. She loves travelling, doing sports and is very fond of movies and TV-series.